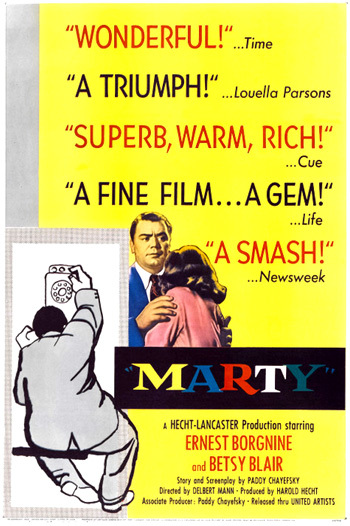 Marty (1955) is the poignant, simple character study of a lonely, unmarried, lovelorn middle-aged, 34 year old son who works as a Bronx butcher and still lives with his love-smothering mother. By film's end, he and another homely 29 year old Brooklyn schoolteacher and female wallflower are liberated - both are triumphant over their respective limitations. The film's screenwriter Paddy Chayefsky transformed his own original teleplay into a successful major motion picture - and the modest film remains one of the best examples of the cinematization of a television play. (The 48-minute TV comedy-drama was originally presented on NBC-TV's "Philco-Goodyear Playhouse" series on May 24, 1953 as a 60-minute broadcast, with leads Rod Steiger and Nancy Marchand, during a period now recognized as the "Golden Age of Television." It received zero nominations during the Emmys that year.) It was the only film based on a TV drama to ever win Best Picture. As a feature film, it was one of the biggest 'sleepers' in Hollywood history, from the independent production company of Harold Hecht and actor Burt Lancaster (Hecht-Lancaster). A modest, black and white film in an era of wide-screen color epics, its critical acclaim and box-office success were phenomenal - its $340,000 production budget yielded over $5 million in gross proceeds. And it was the second Best Picture Oscar winner to also win the Golden Palm (Palme d'Or) at Cannes - The Lost Weekend (1945) was the first. Marty was nominated for eight Academy Awards - and was awarded four - Best Picture!, Best Actor (character actor Ernest Borgnine in a role quite different from his menacing, sadistic villains or murderous 'heavies' in From Here to Eternity (1953) and Bad Day at Black Rock (1955)), Best Director (Delbert Mann for his debut film), and Best Screenplay (Paddy Chayefsky). It was also the shortest Best Picture winner at 91 minutes. I met your mother in a fruit store. She said to me, 'Hey, you know a nice girl for my boy Marty? '...What's the matter with you? Now you get married. You hear what I say!...You should be ashamed of yourself. A second female customer chastises him - he should be ashamed for remaining single for so long: "Marty, you ought to be ashamed of yourself. All your kid brothers and sisters married and got children. When are you gonna get married?" Marty is constantly reminded that he is an incomplete man - single and unmarried. Angie: Whaddya feel like doin' tonight? Marty:I don't know, Ange. Whaddya feel like doin'? Angie: Well, whaddya feel like doin' tonight? Marty: I don't know, Ange. Whaddya feel like doin'? Angie: We're back to that, huh? I say to you, 'Whaddya feel like doin' tonight?' And you say back to me, 'I dunno. Whaddya feel like doin' tonight?' Then we wind up sittin' around your house with a couple of cans of beer watchin' the Hit Parade on television. Listen, Ange. I've been looking for a girl every Saturday night of my life. I'm thirty-four years old. I'm just tired of looking, that's all. I'd like to find a girl. Everybody's always telling me, 'Get married, get married, get married!' Don't you think I want to get married? I want to get married. Everybody drives me crazy. Marty is frustrated by his Italian Catholic mother, Mrs. Theresa Piletti (Esther Minciotti). She drives him crazy over his date-lessness and lack of prospects for marriage: "My mother, boy, she drives me crazy." She complains to relatives about Marty's lack of initiative: "He sits around the house all the time. You know a nice place where he can go to get a bride?" ...Oh, hello there. Is this Mary Feeney? Hello, there. This is Marty Pilletti. I-I wonder if you recall me. Well, I'm kind of a stocky guy. The last time we met was in the RKO Chester. You was with a friend of yours, and I-I was with a friend of mine, name of Angie. This was about a month ago - The RKO Chester on West Farms Square. Yeah, you was sitting in front of us, and we was annoying you, and - you got mad and - I'm the fella who works in a butcher shop. Oh, come on, you - you know who I am! That's right, and then - then we went to Howard Johnson's. We had hamburgers. You hadda milkshake. Yeah, that's right. Yeah, well, I'm the stocky one, the heavy-set fella. Yeah, well, I'm - I'm glad you recall me because I hadda pretty nice time that night, and I was wondering how everything was with you. How's everything? That's swell. Yeah, well, I tell you why I called. I was figuring on taking in a movie tonight, and I was wondering if you and your friend would care to see a movie tonight with me and my friend. Yeah, tonight. Why, I know it's a little late to call for a date, but I didn't know myself till - yeah, I know. Yeah, well, what about - well, how about next Saturday night? Are - are you free next Saturday night? Well, what about the Saturday after that? Yeah. Yeah, I know. Well, I mean, I understand that. Yeah. Yeah. Mrs. Pilletti (serving dinner): So, what are you gonna do tonight Marty? Marty: I don't know, Ma. I'm all knocked out. I may just hang around the house. Mrs. Pilletti: Why don't you go to the Stardust Ballroom? Mrs. Pilletti: I say, why don't you go to the Stardust Ballroom? It's loaded with tomatoes. Marty: It's loaded with what? Marty: (laughs) Who told you about the Stardust Ballroom, Ma? Mrs. Pilletti: Tommy. [Tommy is Marty's married cousin.] He say it was a very nice place. Marty: Oh, Thomas. Ma, it's just a big dance hall, that's all it is. I been there a hundred times. Loaded with tomatoes - boy, you're funny, Ma. Mrs. Pilletti: Marty, I don't want you to hang around the house tonight. I want you to go take a shave and go dance. Marty: (pleading) Ma, when you gonna give up? You got a bachelor on your hands. I ain't never gonna get married. Mrs. Pilletti: You're gonna get married. Marty: Ma, sooner or later, there comes a point in a man's life when he's gotta face some facts. And one fact I gotta face is that, whatever it is that women like, I ain't got it. I chased after enough girls in my life. I-I went to enough dances. I got hurt enough. I don't wanna get hurt no more. I just called up a girl this afternoon, and I got a real brush-off, boy! I figured I was past the point of being hurt, but that hurt. Some stupid woman who I didn't even want to call up. She gave me the brush. No, Ma, I don't wanna go to Stardust Ballroom because all that ever happened to me there was girls made me feel like I was a-a-a bug. I got feelings, you know. I-I had enough pain. No thanks, Ma! Marty: No. I'm gonna stay home tonight and watch The Hit Parade. Mrs. Pilletti: (said with regret) You're gonna die without a son. Marty: So I'll die without a son. Mrs. Pilletti: Marty, put on the blue suit, huh? Marty: Blue suit, gray suit, I'm just a fat, little man. A fat ugly man. Mrs. Pilletti: You not ugly. Marty: I'm ugly, I'm ugly, I'm ugly! Marty: (He rises, agitated) Ma, leave me alone. Ma, whaddaya want from me? Whaddaya want from me? I'm miserable enough as it is. All right, so I'll go to the Stardust Ballroom. I'll put on a blue suit, and I'll go. And you know what I'm gonna get for my trouble? Heartache. A big night of heartache. (He sits, eats some spaghetti, and begins to calm down.) Loaded with tomatoes - boy, that's rich. I got stuck on a blind date with a dog. And I just met an old girl I used to know. I was wondering how I'm gonna get rid of the girl I'm with. Somebody to take her home. Herb: In that case, as long as she's going home alone, give me the five bucks back. Other Man: Look Mac, you paid me the five bucks. The five bucks is mine. Marty turns and notices the homely, shy, skinny woman all alone at a table in the middle of a crowded room. Clara rises from the table, and feeling lost and humiliated runs straight to an outside balcony. He follows behind and asks the weeping woman for a dance - and then comforts her as she collapses onto his chest.